The last two lessons have introduced how to program Raspberry Pi to output signal and turn on LED. In this lesson, we will show you how to get input signal from Button switch and trigger output to turn on LED via program. 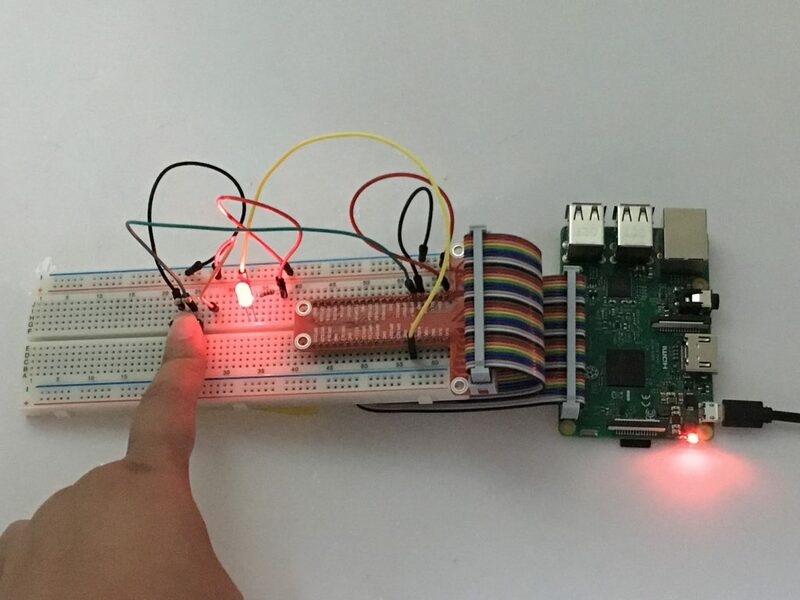 Note: In this lesson, we remotely control raspberry pi via PuTTy on PC. To learn how to config raspberry pi, please visit lesson 1: getting started with raspberry pi. B17 for the button in above graph means BCM GPIO#17 or Physical pin#11 or wiringPi#0(zero). B18 for the LED in above graph means BCM GPIO#18 or Physical pin#12 or wiringPi#1. If the button is not pressed , B17(wiringPi#0(zero)) input voltage is pulled up to 3.3V through 10K resistor . Once our sample code reads high voltage from B17, it will output high level to B18(wiringPi#1) which will turn off LED. If the button is pressed , the B17(wiringPi#0(zero)) input is set to zero(connect to GND) , sample code will output zero voltage to B18(wiringPi#1) which turns the LED on. Once program starts running, the terminal will show print message as code firstly, and then show LED off. 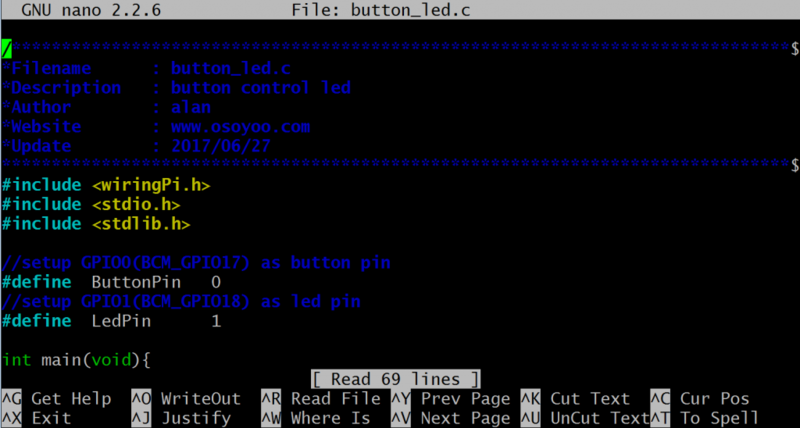 When pressing the button, the LED will turn on and the terminal shows LED On. when releasing the button, the LED will turn off and the terminal shows LED Off. If you wan’t to stop the program, please go to terminal and type command: Ctrl + C.
When programming with Python language , normally we use GPIO library called RPi.GPIO which comes with Rasbian Jessie OS. 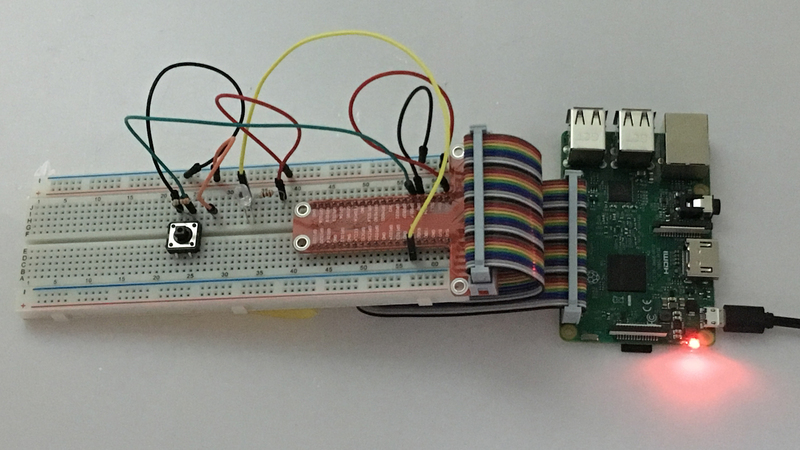 Click here, and you can learn more about RPI.GPIO and Python. Once program starts running, the terminal will show print message as code firstly. When pressing the button, the LED will turn on and the terminal shows LED On. when pressing the button again, the LED will turn off and the terminal shows LED Off. If you wan’t to stop the program, please go to terminal and type command: Ctrl + C.
a. Import Python GPIO Library and time library. 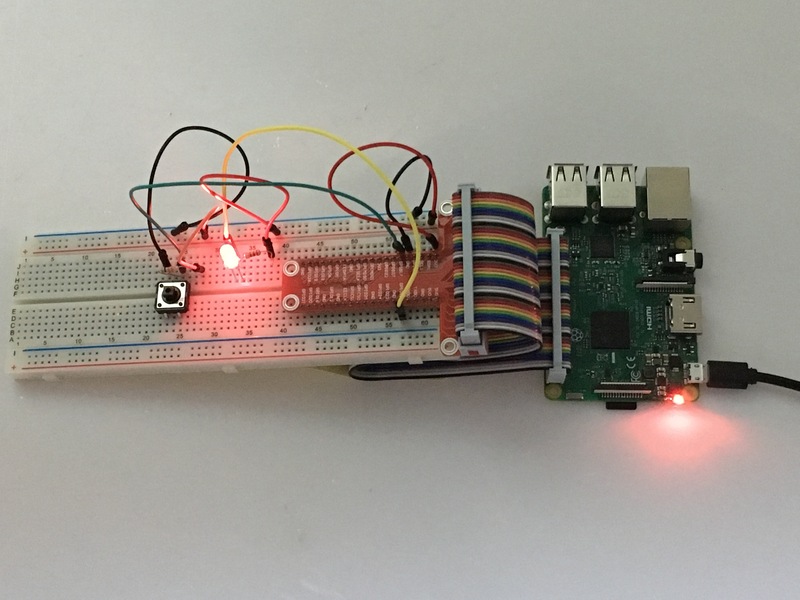 The GPIO library is the library for interacting with the GPIO in Python. It does the job of simplifying the process. The time library is there so we can put a delay in, otherwise the blink might be too fast to notice.Define LED and button GPIO (Here we use BCM#) and set True(3.3V) as the LED’s initial status. b. pinMode(ButtonPin, INPUT) and pullUpDnControl(ButtonPin, PUD_UP) set ButtonPin pull-up input. The program gets a level from buttonpin times and times. While the button is pressed, the program gets low level, and it output low level to LEDPin, and then the LED will turn on. Else, the LedPin gets high level, and the LED turn off. 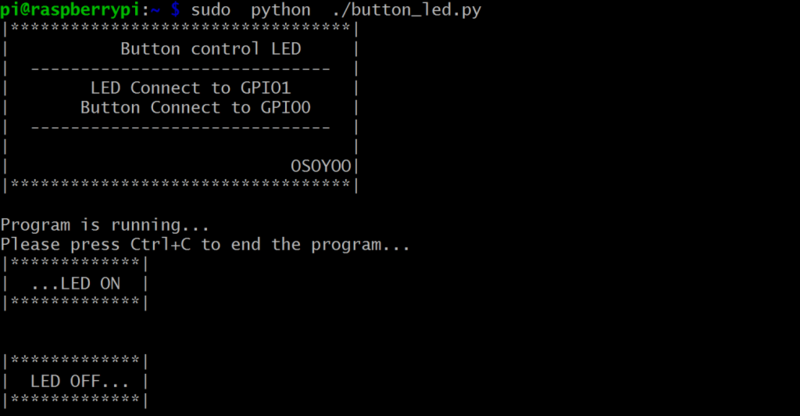 setup function set LEDPin as output mode, and button as pull-up input mode and set up a falling detect on ButtonPin. 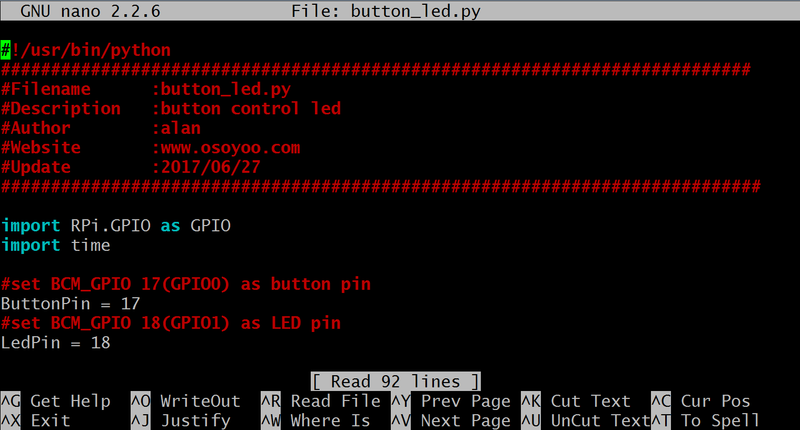 When raspberry pi detects ButtonPin falling off, the program will go back callback function to implement breakoff code. c. In callback function, LedPin level is reversed. It means, when LedPin level is off, the LED is on, and when LedPin level is on, the LED is off. d. main function works as nothing except waiting for breakoff.